Cancellations made 14 days or less before check in date 100% non-refundable. If the reservation involves catering, a 75% refund on catering costs will be applied. &#149;â¢ A maximum of ten (10%) percent reduction in group size is accepted up to fourteen (14) days prior to date of arrival for a refund. Any request to increase the group size will be accommodated, subject to availability. A signed contract is required to confirm room block. â¢ A twenty (20%) percent deposit is required at the time of booking. 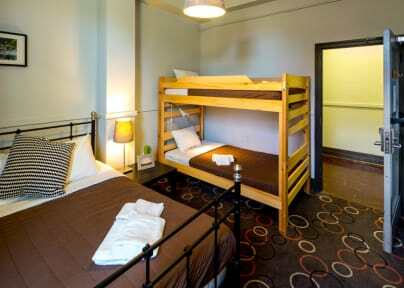 A fifty (50%) percent deposit is required if reservation involves booking at least fifty (50%) or fifty (50) hostel beds. â¢ All reservations must be secured with a credit card at time of reservation. Vancouver's hostel by the beach is located just 30 minutes from downtown. At HI-Vancouver Jericho Beach you'll be surrounded by parkland and sandy beaches, with views of downtown Vancouver, Stanley Park, and the North Shore Mountains at your doorstep. Our 'off-the-beaten-track' location isn't for everyone. If you'd prefer to be near the tourist locations, check out our HI Vancouver Downtown location. If you want to be in the heart of Vancouver's entertainment district, check out our HI Vancouver Central location. If you want to be surrounded by parkland, steps to the beach, and have access to hiking/ biking trails - come check us out! Live like a local and experience all Vancouver has to offer here at the beach.Surrounded by parkland and beaches, we're located in the friendly neighborhood of Kitsilano, a 30 minute bus ride from downtown Vancouver and 10 minutes from the University of BC. Cycling, kayaking, beach volleyball, wind-surfing and hiking are within easy reach. Bike rentals are available at the Front Desk. Facilities include free wireless, fully-equipped kitchen, laundry, and a licensed cafe. Help offset your worldly travels and make a difference in our park with The Earth Easy Project. A little change can make a huge difference; a little effort can make the world better. HI Vancouver Jericho Beach is located in beautiful Jericho Park, and the Earth Easy Project enables travellers to offset their environmental impact in two ways; ask at the front desk for further details. Our friendly staff look forward to helping you! The hostel is open from May 1 to September 30. The staff made great accommodations for myself as a walk-in guest. I met other great travelers under their roof, and I can't complain much about my stay. It was a pretty clean and straight forward stay. I had to park my rental a bit further down the road, but I didn't mind walking back into the building. I would definitely stay here again if I were to return back to Vancouver, British Columbia! Hostel was good for couple of nights but we didn't want to spend any more time there than that was necessary. It wasn't really cozy and it smelled like water damage. The hostel was pretty much as expected. Location is not the best. Rooms and bathrooms could be cleaner. Lockers require own lock; they could be a bit more modern. There are no sockets in the rooms!! Lights on, lights off, lights on, lights off. People talking, drinking beers, laughing loud at 1 am in the room. That's not your fault, but the staff should defenitily remind the clients about the basic reciprocal-respect rules... Plus the staff should make an effort: smile a bit, they look pissed of, explain us where our room is, where the kitchen is. We have no idea what is where when we arrive. The WiFi was unusable in the dorm. The dorm had no plugs, which is honestly something that I never thought would be a thing, super inconvenient! Only giving this a 2 because zero isn’t an option. Facilities are very run down. 18 bed dorm only has one light switch for the whole room. No power plugs in the room, not may in the common areas. Spend a little more are get a private room if possible or for somewhere closer to the city.